An international team of scientists captured the first ever images produced by a supermassive black hole devouring a star. 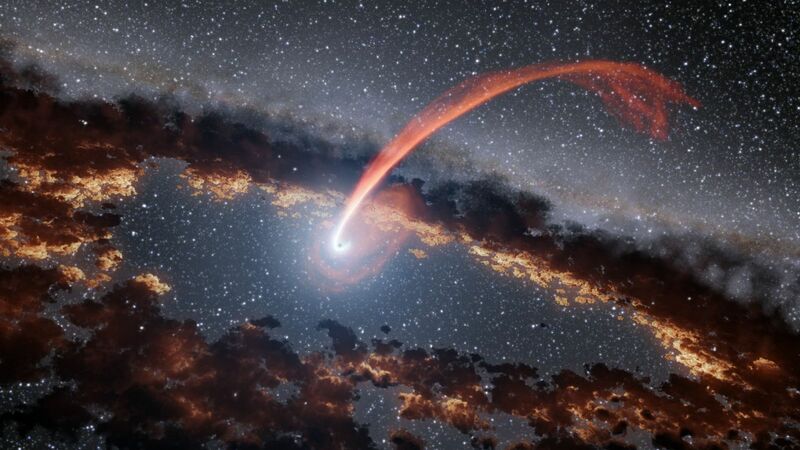 Located at the core of one of two merging galaxies, the black hole, which is 20 million times more massive than the Sun, captured a star that ventured too close to its event horizon, the boundary beyond which nothing can escape, including light. 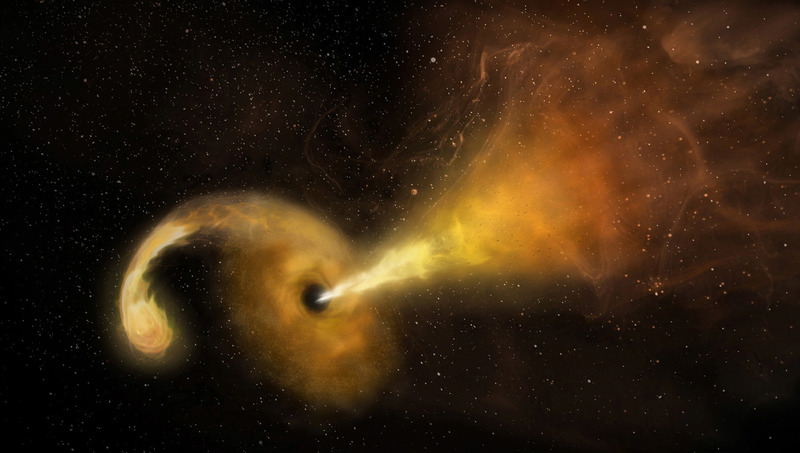 The devouring of a star by a supermassive black hole is known as a tidal disruption event or TDE. Studying them gives scientists insight into the environment in which galaxies formed and evolved billions of years ago. Observed by astronomers since 2005, this event is occurring in galaxy ARP 299B, almost 150 million light years away. When they detected a very bright burst of infrared emission coming from the center of one one of the colliding galaxies in January of 2005, astronomers began observing the location using the William Herschel Telescope located in the Canary Islands. They subsequently studied it with a variety of other telescopes, including the National Science Foundation‘s (NSF) Very Long Baseline Array (VLBA), NASA’s Spitzer space telescope, the Nordic Optical Telescope on the Canary Islands, the European VLBI Network (EVN), and various other radio telescopes. In July 2005, using VLBA, the researchers detected radio emission coming from the center of ARP 299B. Because many supernova explosions had been seen in this particular galaxy, researchers initially thought they were looking at a supernova. When radio emissions from the site started appearing elongated in 2011, they realized the expanding phenomenon is actually a jet. Subsequent observations showed material in the jet, which travels at one-quarter the speed of light, expanding in a single direction. Because radio waves pass through dust instead of being absorbed by it, the researchers set up a network of radio telescope antennas, each several thousand miles from its nearest neighbor, to observe the jet in high resolution. With concentrated masses ranging from millions to billions of times that of the Sun, supermassive black holes have extremely powerful gravitational pulls. When they are active, they pull in materials that come too close to them, which form a disk that rotates around them. Known as radio galaxies and / or quasars, these black holes emit very fast jets of particles when they devour incoming material. This study has provided researchers with the opportunity to study something that had not been studied before. “Never before have we been able to directly observe the formation and evolution of a jet from one of these events,” Perez-Torres emphasized. A total of 36 scientists from 26 institutions worldwide took part in the long-term research project. Their findings have been published in the most recent issue of the journal Science. A diagram, not to scale, showing the components of the TDE observed in Arp299B. The supermassive black hole at the center of the galaxy is surrounded by a highly dense medium, and embedded in a dusty torus. Most of the optical and X-ray emissions produced by the event were absorbed, and re-emitted at infrared wavelengths due to the existence of polar dust. A few months after the detection at IR wavelengths, the TDE was detected at radio wavelengths with the help of a very sensitive array of radio telescopes. Image Credit: Seppo Mattila, Miguel Pérez-Torres et al.